Naturally, when you spend a weekend in the Swiss Alps, you will be in the mood for a fondue plausch. You might not even know what a plausch is, but that doesn’t stop you from wanting it. You scour the kitchen in your rented Alpine apartment to prepare for your plausch, but there is nothing (nothing!) that would indicate any kind of cheese melting choices. No plausch? No problem. Not. Because at this point, you may not be able to have a plausch, which only makes you want the plausch more. 2. Ask the restaurant below your apartment if you can borrow a fondue set. 3. 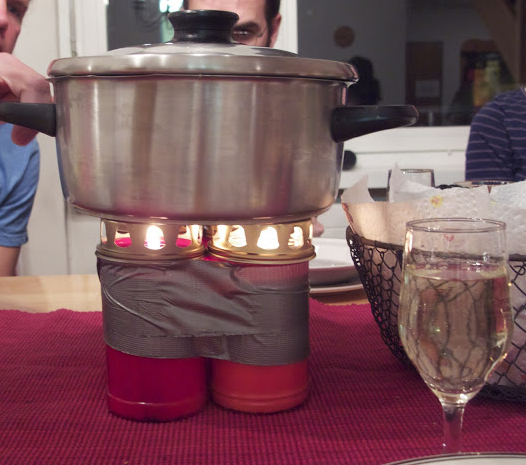 Yell that it’s not Swiss not to have a fondue pot in a Swiss apartment (see 1). 4. Check if there’s a brocki in town. 5. Resort to a little American creativity. Set two grave candles next to each other and two grave candles directly behind them. Wrap duck tape around all four candles (works best if you wrap the duck tape so it touches the bottom of the gold metal candle cover). Get out kitchen pot. Throw in fondue stuff. Stir a lot. Move melted pot of cheese from stove and set it directly on top of the lit grave candles. Plausch it up for 72 hours, depending on quality of grave candles. Note: Blow out candles if you prefer a shorter fondue plausch. Just so you know, when the Zombie Apocalypse hits we're coming to your house so you can take care of us. Not elegant but practical. I really miss a good fondue!